Duncan had lymphoma. We could slow it down, but we could not stop it. It was devastating news… for Duncan…for me…and for Frankie. After the initial shock, a haunting question remained. What would happen to Frankie when Duncan died? Timid, fearful Frankie could never be an only dog. He needed a pack - the bigger the better. As Duncan began six months of chemotherapy, I began tentatively planning for the inevitable. 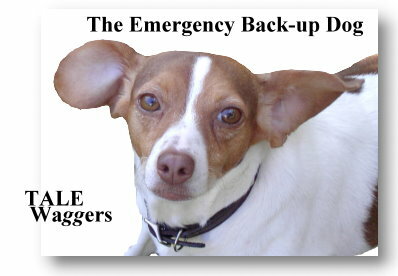 What was needed was an emergency back-up dog - a dog to be there for Frankie, and for me, when Duncan was no longer with us. A puppy was out of the question. Between my job and Duncan’s chemo schedule, time was scarce and Duncan deserved to be the center of attention for the time he had left. My vet, helpful soul that he is, said “with your luck, I’d get a mutt - just a regular dog.” The theory was that hybrid vigor would give me a rest from huge vet bills. Slightly shell-shocked, I clicked on Petfinder and searched for terrier mixes. That seemed like a sturdy "regular" dog. I scrolled through page after page and there she was. Her name was "Suzi” – a small, short-haired dog with ears like a disappointed bat. Under the picture was a brief, sad story. She was picked up wandering the streets after having a litter of pups that were never found. She looked a little stunned – just like me. I sent her photo to some friends, then let it go. I wanted to see how Duncan would handle the chemo before adding more stress to all our lives. But even with the chemo, we were just buying some time – putting off the day Frankie would be alone. Duncan did very well on chemo. It never made him sick and he went into remission immediately. Months went by. Every now and then, I would go to Petfinder and look for Suzi. Each time, I was amazed that she was still there. I figured the rescue just didn’t have time to remove her photo. Surely a small, young, cute, dog like that would be snapped up by someone. I’d get around to asking about her…someday. Then fate got tired of waiting around for me to figure out what to do and gave me a mighty shove. I took Duncan in for his chemo on the usual day and time, but there was a back-up and he was ready for pickup much later than usual. On our other visits, the waiting room had been filled with anxious pet-parents waiting to pick up their furkids and head home. I’d always chatted with one or two of them while I waited for the sound of Duncan dragging some hapless intern down the hallway. This time the waiting room was almost empty; just one lone woman sitting there. We struck up a conversation. She told me she usually brought her dog in on another day, but her schedule had changed this week. We chatted about our cancer dogs. At one point she said she ran a rescue. I asked which one. The name sounded vaguely familiar. Where had I seen that name? Then it came to me. “You’re the one with Suzi? !” On a day she wasn’t normally there, at a time I wasn’t normally there – we were the only two people in the normally crowded waiting room. Any other combination of events and we would not have met. I was still processing this information when I asked if Suzi had found a home. The answer was no. I could not believe it. I explained that I’d been staring at that photo for months. It must be fate! So, I did the only thing that made sense at the time. I arranged to have her bring Suzi over to meet Duncan and Frankie. “She’s cute!”, I squealed, and she was. It was the evening of Easter Sunday and she sauntered into the house like she already owned the place. Frankie and Duncan inspected her rear end and were immediately smitten. She took a look around, hiked her leg on a potted plant and then settled into my lap, where she stayed for hours while we talked. I honestly don’t remember if I decided to keep her then, but she’d already made her choice. She had to be dragged from my lap. At the time, I thought it was another “sign”. Later I discovered that her favorite place in the world is the lap of any stranger. After she left, the boydogs pouted for a week. The next weekend, she came back to stay. Little of her story was known. She was picked up wandering loose and taken to a high-kill shelter in Ohio. There she was spotted by a member of the rescue group and whisked away to Michigan just before her time was up. The rescue’s vet felt she was only a year old and she had obviously had puppies recently. What happened to the pups and why she was loose, we will never know. She was very thin and very frightened. When rescue took her from the shelter, she would only crawl. She was fostered with a pack of German Shepherds and she put on weight and gained confidence. No one came for her until I sat down in that waiting room. Now she'd quite happily joined our pack and Frankie and Duncan were beaming with pride. I re-named her Holly, after Holly Golightly in "Breakfast at Tiffanys". She had a sweet face, liked to party and had a mysterious and troubled past. I took her to a local pet store to get her a new collar. Everyone gathered round to admire her and pat me on the back for adopting this poor lost dog. My neighbors came to admire her. She loved everybody and everybody loved her. That afternoon was pretty much the entire honeymoon. I had been warned that her one flaw was that she liked to dig holes – big holes. As advertised, she dug a hole large enough to hold her entire body in 2 minutes flat! She also preferred to dig in mud - so much easier. Every time I let her out, another hole appeared. The yard looked like a minefield and the kitchen floor was covered with so much mud that all I needed for a lush indoor lawn was grass seed and a little more water. Three baths later, she was on my bed for the evening. She scrambled up to my chest and latched on like a limpet. That’s when I discovered how much a small, short- haired dog can shed. I was choking on hair and the last thing a hot-flashing menopausal woman needs is a live fur collar to wear to bed. As I inhaled gobs of hair and sweated in her death grip, Frankie and Duncan took turns stomping across the bed to smell her rump. It was a long, long evening. The next day we went out in the yard to enjoy the spring day. A fledgling bird tumbled onto the lawn. Holly grabbed it with a speed I could not have imagined and took off across the yard. As I chased her yelling “drop it”, she ATE the bird. She ate a living thing… whole. Only one bloody feather was left. After years of Cocker Spaniels, I was unprepared. They will grab birds and sometimes kill them by tossing them around. This type of prey drive was too much for me, but Duncan and Frankie talked amongst themselves and decided that her hunting skills made her even more irresistible. Frankie and Duncan adored “the old broad”. She was not my dog. She was their dog. They played with her, used her as a pillow, and took turns sniffing her seemingly magical rear end. Whenever Duncan was angry or frustrated, he would walk over and take a whiff of Holly’s rump and everything was fine again. Frankie blossomed in his newly expanded pack. The arrangement suited everyone – everyone but me. I was constantly cleaning up mud, her indoor potty areas and her hair - and prying dead things from her mouth. In the evenings, she would wait for her turn on the human and then launch herself onto my lap and scramble up to my face, leaving red claw marks in her wake. If I yelled at her, Duncan would come over and put a paw on my chest and look into my eyes - as if to say, “but we love her”. Every night I would hold her and pet her and tell her “you’re a very nice doggie but you just can’t stay”. I desperately wanted her out of my life and out of my home. I wanted someone else to deal with the digging, shedding, clawing, pooping, peeing, killing machine. But she never went anywhere. For the most part, her bad habits were eventually defeated. One day she made the connection between digging holes and getting baths and quit cold turkey. There has never been another hole. She learned to please me by not killing living things. Gradually, our yard became safe for small creatures again. Potty training improved – slowly and painfully – but never fully caught on. It took a year for her to get the idea of peeing outside. Pooping outside seemed a more difficult concept. To make matters worse, she and Frankie came up with a plan to cover up her accidents by eating the evidence. Her sweet nature was constantly overshadowed by her weaknesses.